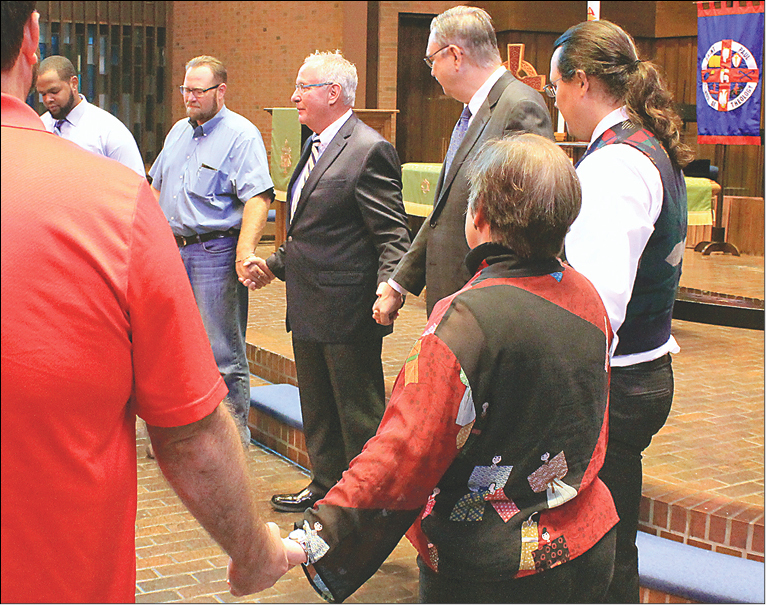 The scene of worshippers in a cozy circle beneath high, multi-hued sanctuary windows Aug. 30 showed the remarkable gift of community that is part of Saint Paul seminary life at Oklahoma City University. The seminary’s ninth academic year on the OCU campus opened with the Convocation Service in Smith Chapel. Preaching was Neil Blair, new president of Saint Paul School of Theology, a United Methodist school with two campuses. Communion, prayers, classic hymns, and scripture reading are anchor elements of such a service. Dedication of a new seminary mission statement made it distinctive. The service became transformative when, at President Blair’s request, the people circled up. Joining hands with them, he spoke quietly to students and staff as one of them. (He is a Saint Paul alum.) His hopes for the future carried God’s heartbeat. Here is the new mission statement: "Centered in Christ and rooted in the Wesleyan tradition, Saint Paul School of Theology is a seminary of intentional relationships committed to the formation of people for innovative, creative ministry through rigorous academic life; the exploration of Scripture, tradition, and ministry practices; and diverse, contextual experience." Nancy Howell led the dedication litany. She is the seminary’s executive vice president. In the Prayer for a New Academic Year, Rod Newman thanked God for new books and binders, students and learning; and "for all those persons through time who bore witness and made this new beginning possible." That brought to mind a special classroom in the building. The university recently designated the Hayes Room to honor the bishop who was key in planting Saint Paul School at OCU. Retired Bishop Robert E. Hayes Jr. is chair-elect to Saint Paul’s board of trustees and has been named Bishop-in-Residence, beginning in Fall 2017. Rev. Newman also prayed on behalf of the community, "We offer ourselves to name anew for each generation the wonders of God." He is chaplain coordinator for Saint Paul at OCU and pastors at Norman-Bridgeview UMC.